This review shows that Varista Trade is an investment that will quickly disappear. 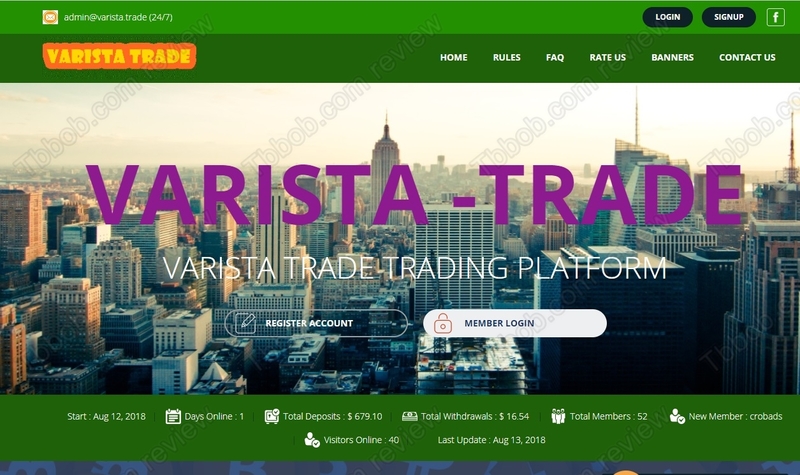 According to its presentation, Varista Trade is a company that makes money in cryptocurrency trading. It offers investment plans to the public with returns up to 20% per 12 days, which means 50% net per month. Is it a real opportunity? No, Varista Trade is not a genuine investment opportunity. 50% per month is too much for any legit business, even in cryptocurrencies. The way Varista Trade works is a Ponzi scheme. It will just collect money from the public and maybe pay out some profits at the beginning, just to attract more investors in. But because no real business activity is going on, no revenues are generated, this scheme always quickly runs out of money. Withdrawals will exceed deposits, that is given, and then it will collapse. Varista Trade claims to be a real company registered in the UK, but it is not true. Check our picture to see that the Companies House knows nothing about Varista Trade. It means that Varista is a fake company, anonymous and not regulated! Varista Trade is a simple Ponzi scam that is going to quickly disappear with all the money, stay away from it! If you want to experience genuine cryptocurrencies trading, try a free demo with a regulated broker. If you want to later start trading with real money, be sure to understand the risks and to have a good trading strategy.